Mercury Energy Hydrologist Daid Payne presented an explanation of the consents that Mercury has. Advocates were vocal at the time of the application for consent for the whole Mercury system. From that application Mercury was granted a 35 year consent for controlling its system through to 2041. Every 5 years the consent conditions can be reviewed. It is discretionary. It can not relitigate the consent. It can’t change the consent conditions. WRC initiates the review and the next review is 2018. The key point is that the consent can not be removed but if a matter that could not have been envisaged at the time of granting consent then that can be considered. Allowances for flood situations. The Waipa river, (a tributary of the Waikato) joins the Waikato at Ngaruawahia and in flood conditions is often in conflict with flooding at Taupo. Accused of favouring flood relief in the junction area the respose is that people from there see the favour being accorded to Taupo. The widening of the mouth of the channel from Lake Taupo to the Waikato river in 1941 increased the channel capacity from 360 m3 to 180 m3. Storage is turned over 6 times a year. Weather forecasting is based on 2 days out for action to be taken. Rely on the NZ Met service. Beach profiles are undertaken 5 yearly though some key beacjhes are profiled annually. Consents are different to the consent granted to ECNZ. Rick Liefting of WRC Regional Hazards Flood Management team explained the High flow management plan. The maximum level of 357m can be exceeded but not often. The issue is that the inflow can not be controlled and the outflow is. 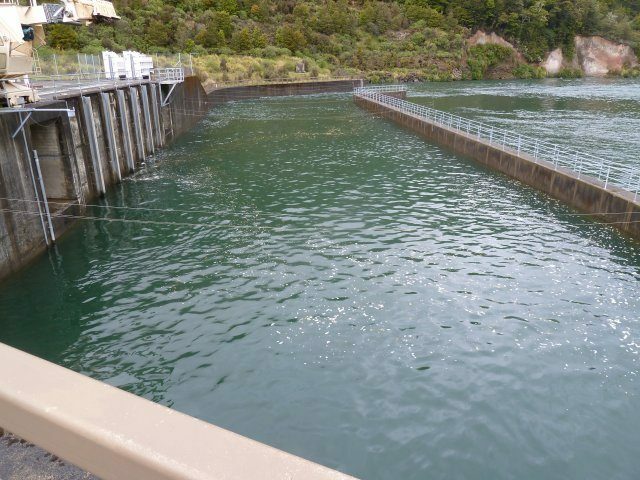 The difficulty is balancing flows to reduce impact on both Taupo and the lower river. Concerns exist with the impact of a warmer climate. Maximum wave height is 1.5 meters. The problem with waves is that of wave push (waves meeting shallow water zone) resulting in wave overtopping (causes erosion). Biodiversity is the 2nd largest item in the Long Term Plan (LTP). Implementation on the Tongariro River remains stalled in discussion with Iwi. Proposal to put a petrol station on Parklands is a divisive issue. 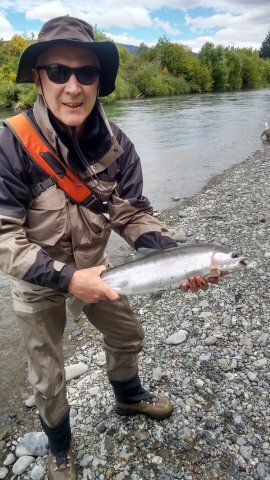 The Advocates are inrerested in this development as many have property here in this unique world class trout fishery. It is an argument frpm within the Tongariro River catchment. This video clip from the NZ Herald outlines some of the opposition to this venture. 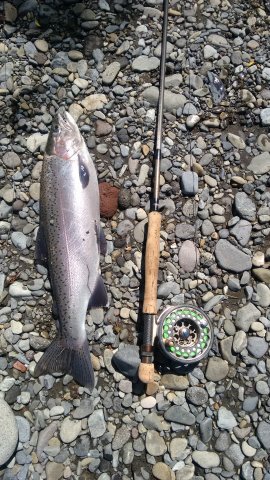 The Tongariro River is used for Hydro Electric Power and it is important that we have a relationship with Genesis. With Virginia Church I attended yesterdays informative meeting. There have been a number of staff changes an it is good to meet the staff. Craig Brown is the new site manager. He is a pleasant, approachable young man. He has previously been part of the Genesis Environment team. Bonnie Lawrence has left and moved to Southland. We appreciated all discussions we had with Bonnie and thank her for this. Lauren Fletcher was part of the admin team and has now gone to the Tuwharetoa Maori Trust Board. Chris Normandy is now part of the Hydrology team. Earlier I have reported that Jared Bowler had left after some years at Genesis and gone to Contact Energy. It is good to meet the new members. Craig Brown started the meeting with a video presentation of the future of Electricity as seen by Genesis. I thought it vert good and from You Tube have put it on this site. 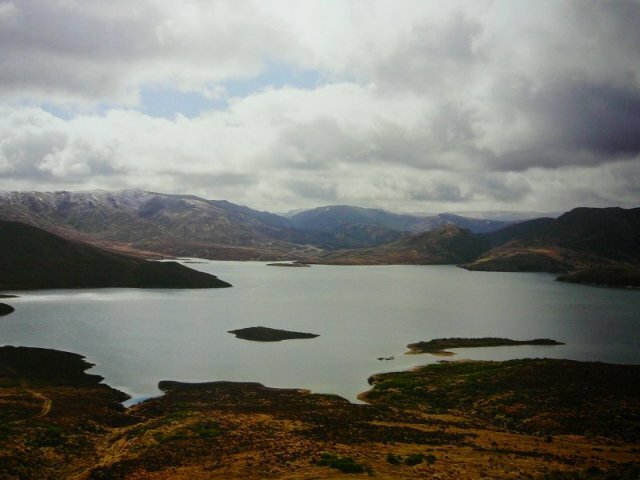 The Tongariro River has only Lake Moawhango on Army land for water storage. and the thick layer of sediment that covered the river bed after the flood I asked how much sediment was currently in the Rangipo dam and was surprised that the sediment was released earlier in the year in the flood caused by cyclone Donna and the sediment washed through to the lake without notice. This was a good improvement. The river is in good heart and the monitoring of aquatic life shows the river to be in good heart. The Check Clean Dry message more important than ever. Please note ‘Rock Snot’ (a term sometimes given to Didymo) has not been found in Waikaremoana. Lake Snow (sometimes called ‘Lake Snot’) identified as an aquatic invader from Washington State in the USA, is now found in 14 NZ lakes and was recorded in Waikaremoana back in 2008. It is now, for the first time, creating operation problems at Tekapo A power Station, blocking cooling water intake screens. However, in Waikaremoana it is not (yet?) creating the green slimy mucus it does in Wanaka or Hawea or which block screens at Tekapo. You are 100% right though, we sure don’t want it in Taupo! Outlined the impact of license sales. Family licenses have been popular but overall participation rate is down. Runs still continuing though later in the season expect fish to be smaller. 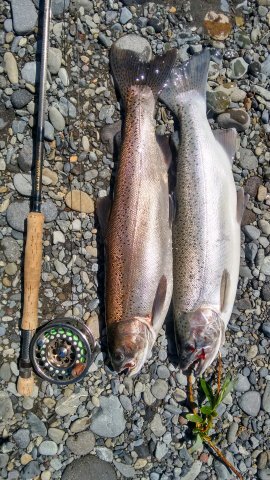 The photos below are from my fishing with Mike Forret over the last 3 days. Plenty of excellent fish and it is November. Of the 8 fish caught only 1 was a spent fish. The problem of Catch and Release. In many catchments catch and release is admirable. 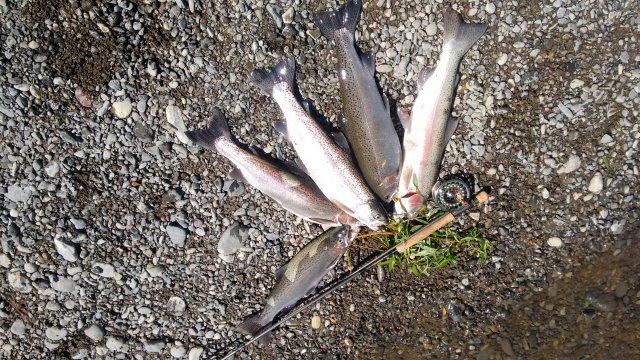 The Whakapapa river is becoming a trophy river but taking of fish jeopardises the fishery and catch and release is encouraged. The Taupo fishery is the opposite and anglers are encouraged to take all legal sized fish caught. John Morgan spoke about the campaign to save the eel (tuna) in the Whanganui Catchment at Lake Otamangakau. The Long Finned Eel is in danger of becoming extinct. Eels are long lived (100+ years). The big eels are female, small eels males. The problem for eels migrating up the Whangnui is that they get trapped when diverted into Lake Otamangakau. Unfortunately a big education programme is required to save the eel. There has been much vandalism of signs advising the programme and people entering the trapping area to take eels for food. It was good to see the work being done on clearing the Tokaanu Stream and restoring the flow to the stream through the removal of willows which have choked the flow. 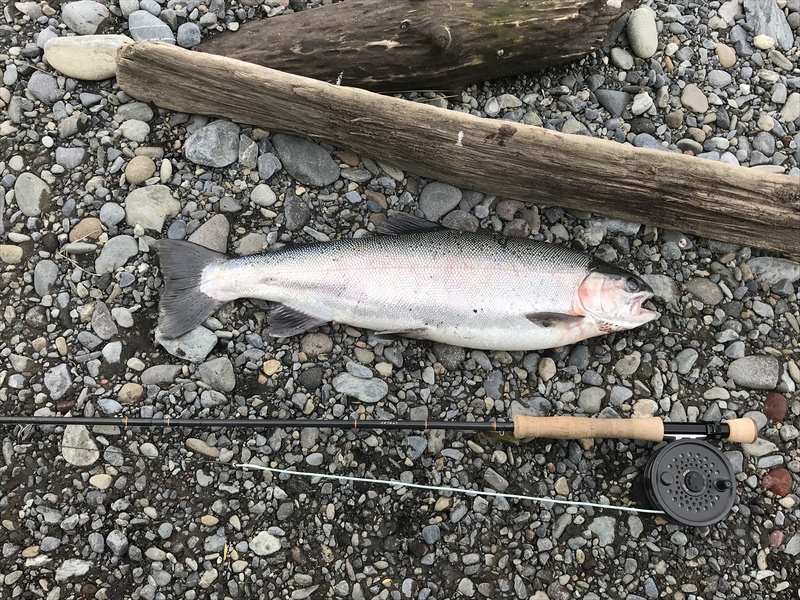 Along with the work of Genesis on Willow removal from the Moawhanga and much improved flows and health of those streams is a warning of the developing issue of Willows on the Tongariro River. I found the meeting informative.